So, it seems smart casual is simply a more stylish – youthful looking perhaps – version of business casual. The idea of being fashionable or stylish can be very off-putting for some men, perhaps intimidating or seemingly too fussy? But the impression left by a well put together outfit might be worth the extra effort/attention in order to project greater social adeptness. Let’s take a look at some smart casual outfits I spotted at in San Francisco which will hopefully inspire. Key words in describing smart casual are neat, slim fit, professional and casual. With the outfit pictured above, we can check off all those boxes; the gentleman wears a slim fit button down shirt (notice an interesting detail: the dark stripe of the plaid changes from vertical to horizontal between the top of the sleeve and wrist), slim fit dark denim jeans and well polished black loafers. This next outfit is teetering on the border of not-neat, although in my opinion, it is saved by the well groomed beard and extra stylish black scarf. Rolled up sleeves and Chuck Taylors give it casual leanings while the open shirt with grey undershirt – smart alternative to the standard white! – and brick red chinos give it an extra boost of stylishness and flair. This ensemble would obviously be more in line with a San Francisco start up than a corporate environment. It would also be ideal for an art gallery opening: uber European. Our third muse wears a slim fit (not snug nor tight, thank goodness!) long sleeved black shirt with slim legged grey jeans and tan suede oxfords. A very simple, yet sophisticated, neat and well, smart look. The black shoelaces are a nice, unexpected touch. 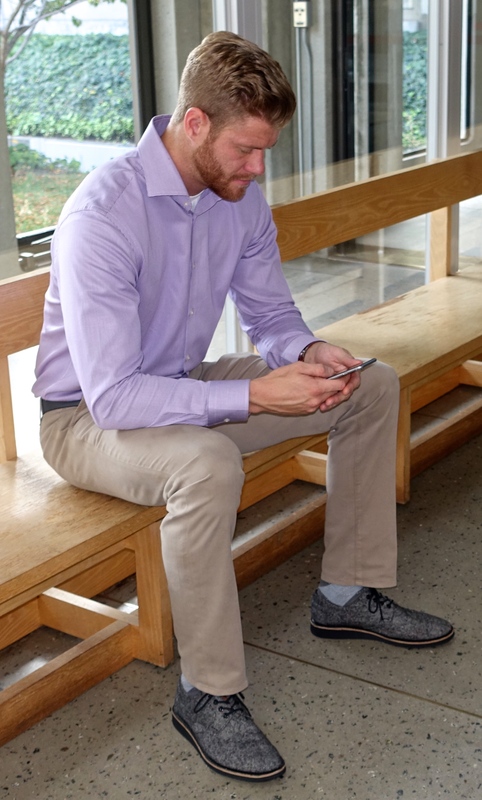 The slim fit of apparel on the gentleman pictured above is what separates him from the business casual crowd, as well as some personal taste on display: lilac colored button down and oxfords with a black and white speckled wool upper. 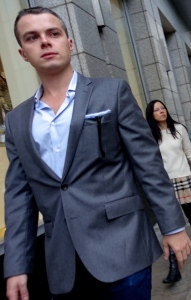 The item which converts this muse’s outfit from business to smart casual is the slim fitting jacket. It’s an exceeding smart topper, don’t you think? In the case of the muse pictured above, it is the jacket as well as the chic loafers and white (less traditional!) colored chinos which make this look smart, and the tee under the unbuttoned jacket is a cool touch, keeping the ensemble casual. 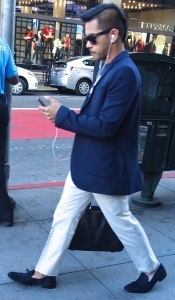 The muse above demonstrates what I would call another smart casual look for work at a San Francisco start up. I love the grey scale dressing here. The sneakers are super relaxed, and I wouldn’t mind seeing the grey colored jeans hemmed further up to avoid bagginess in the legs, but I can easily put those out of my mind when I see how marvelously the light light grey jacket and darker cool grey sweater add a serious dose of sophistication. It all coordinates fantastically with his silvery hair cut in a fashion forward, edgy style. As you may have noticed with these awesome smart casual looks, the more casual you go in one part, the more dressy you can get with another. I love this combination of ultra faded (not baggy!) designer jeans with slim fit checkered suit jacket over plaid button down shirt. What binds together these “contrasts” in terms of dressiness are the homogenizing effect of a nearly grey scale palette: white to grey to faded denim (greyish blue) to black. The muses pictured above and below demonstrate a couple awesome ingredients for increasing the sophistication level: open (unbuttoned) black sport coat and stylin’ shoes. The tucked in button down shirt shown below is a slightly more appropriate (conservative) look for most workplaces. Our next muse looks very smart in a suit jacket with the bottom button unbuttoned (noticeably more laid back) over a crew neck black and dark grey sweater with white button down shirt underneath. The skinny dress pants he wears are very stylish, and the light color makes this a much livelier and more casual (less stodgy) look. The recently polished black oxfords are a nice “finish”. Our last must below rocks a sheeny blue-grey suit jacket with light blue button down, matching (light blue) pocket square and dark blue jeans. Notice this jacket is also unbuttoned at the bottom? Too cool! After viewing these great looks, I imagine it might not seem so daunting for the less experienced in dressing “smart casual” to give it a whirl. Essential elements are fitted (although not snug/tight) cuts, some flair in terms of fabric and/or color which can be achieved with a jacket or shirt and casual elements, such as keeping the jacket unbuttoned at the bottom. Lighter denim or faded jeans might be best left to the more expert in combining casual and dressy/sophisticated, but one cannot go wrong with dark denim and a sport jacket or a navy blue jacket with light colored chinos. It’s all a balancing act in the end: a dash of “laid back” with a pinch of “polish/professional”. With traditional men’s garb traditionally being on the more boring, standardized end of the spectrum, I hope this will motivate some to have lots more fun!